One of my very best BFFs seemed to be reflecting upon a park in New Jersey last evening, and posted a line from a particular little ditty as her status on the facebook. It got the song running through my head, of course- the super-rhyme-scheme is catchy as all get-out, but the version that popped in there was Manfred Mann’s cover of the tune, rather than Bruce’s original. Which, while not surprising perhaps, got me thinking some interesting things about creativity and muses and suchlike. Before she became a brightly-coloured musical instrument (usually associated with circuses) Kalliope/Calliope was the Muse in charge of cool things like epic poetry and eloquence. Capital-M Muses were the Greek goddess-types who provided the inspiration for all those things I like best- art, literature, music, history- you know, those things that we create that connect us as humans. Shrines to the Muses- museums– are pretty much the closest I tend to get to entering places of worship on anything like a regular basis, and as anything other than a tourist. I like museums. A lot. They are places of reverence, to me. And they feel like home. The Muses are definitely ladies after my own heart- even if I have seen neither hide nor hair of their influence lately. The Romans picked up on the idea of the daughters of Zeus (the Big Boss) and Mnemosyne (Memory- in goddess form) and assigned them particular roles. Historian that I am, I’ve always been a wee bit partial to Clio (with her scrolls and all), but all props need go to Kalliope for inspiring the epic-ness of Mr. Springsteen’s well-rhymed song. 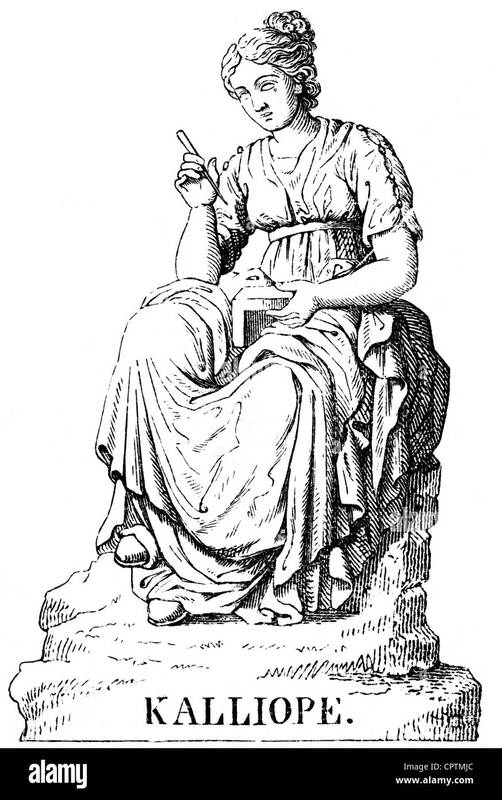 Kalliope is generally pictured with a writing tablet- reflective of her importance to those who wax poetic- and was called, by peeps as important as Ovid, the Chief of all the Muses. She was mother to Orpheus, and the inspiration and whispering Voice in the night that drove Homer to write a couple of well-known ditties, about a guy named Odysseus and about a conflict in a town called Troy, of his own. My beloved Dante spoke well of her: But, since I am yours, O sacred Muses, here let dead Poetry rise again, and here let Calliope sound, a moment, accompanying my words with that mode, of which the Pierides felt the power, so that they despaired of pardon…’ (Dante references the first Battle of the Bands- won, natch, by the Muses, who then turned the upstart Thessalonian daughters of King Pieros into magpies for their extraordinary presumption in challenging them to a sing-off. Think Glee/Pitch Perfect, but for keeps). Kalliope is usually described as the eldest of the sisters- something I know a little something about. She’s also considered the wisest… but I’ll leave that one alone, lest my sibs take offense (Happy Middle Child Day to the mid-sis, BTW. Who knew there was such a thing? I guess I missed the notice while I was busy celebrating International Cat Day on the weekend. We humans are ridiculous sometimes…). I’ve been more than a little short on the inspiration and harmony lately. I mentioned all that a couple of weeks ago (has it been weeks, already? Time does fly when you’re out of creative juice…), but I have been trying to pay closer attention to the things going around me since then, so I suppose some progress is being made. I’ve given some thought to sources of inspiration and creativity- and, funnily enough (that interconnection thing again), I flippantly referred to a friend as my (small-m) muse, since he was more than a little responsible for my last post. I used a winky-faced emoticon when I said it, but some emoticons hide truth, sometimes, methinks. Bruce wrote Blinded by the Light because his record company insisted that Greetings from Asbury Park, N.J, his debut album, needed something a little more single-y, more hit-esque, than the songs he’d already come up with. He wrote the lyrics first- unusual for him- using a rhyming dictionary. The result is pretty damn clever, indeed- especially for someone like me who loves playing around with words and who can recognize mastery of the craft. The language-play is full of images and stories that leap at the listener as the song unfolds, reminiscent of some of Dylan’s coolest poetry-set-to-music. For all Bruce’s undeniable prowess, Manfred Mann’s Earth Band’s version is better-known -and contains one of the most frequently misheard lyrics of all time. Interesting how certain things translate well, while others can become indecipherable when the origins are messed with. The piano line(s)- and the interlude of Chopsticks– are instantly recognizable. The steam piano that, with unpleasing sneezing and wheezing, crashed to the ground, is noted for its volume. Powered by steam or compressed air, calliopes were primarily used on riverboats and circus carousels and the music carried for miles, suggesting that listeners should come closer. Check it out. But, since pitch is affected by the steam, they are almost always out-of-tune on the higher register. So. Loud and off-pitch. And associated with circuses and all the, uh let’s say down-homey, atmosphere that they can conjure. Sort of totally the opposite of that other Kalliope- what with all her wise, grand, poetic harmony… Yet the instrument entices, and encourages, and draws us in, as it rasps across great distances. The play on light and darkness, and the implied aversion to creative expression in the person of the police officer, evoke so many cool things that resonate with the paths down which my thoughts have been traveling. Inspiration can come from any number of sources. I tend to find mine, most often, in other people. With our contemporary state of communication being what it is, social media can be, for all its faults, a sometimes-useful tool to catch up with the important peeps and tap into those things that are driving them forward. Or just keeping them going. Our muses can be myriad- if we take the time to pay attention. I’ve been bad at that lately. But I’m working on it, and listening to those Voices I love. Even if the things they say are off-hand, or ‘thrown-away’, or representative of nothing more than a current playlist- it’s a pretty fruitful place to start. As is memory- that Mother of all Muses- perhaps especially when the memories seem to be placeholders of regret. The ‘way back home’ does, at times, require treading in the darkness of night, but we shouldn’t be hanging out there, eschewing the light, for too long. What sights does our sun see when it looks down upon its third planet, after all, but the wonder that is us, and all our human potential? Whether it involves cutting loose or revving up (though not, hopefully, ‘wrapping up like a douche.’ Never that…) it’s time to listen to those shooting stars, sitting in sidecars, humming their lunar tunes, and realize that I will, with help, make it all right. And, perhaps, make things all right. Even when those boulders on my shoulder get me feeling older. Bruce knew what he was talking about. It starts with sticking together and being sources of inspiration and creativity to one another. All runners in the night- chasing our Kalliopes, and calliopes, wherever they may lead.